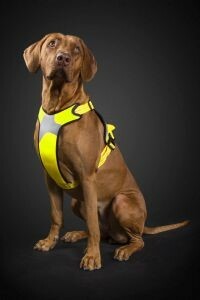 A sturdy harness for dogs on the move the Hurtta Dazzle Harness is easy to put on and comfortable to wear. 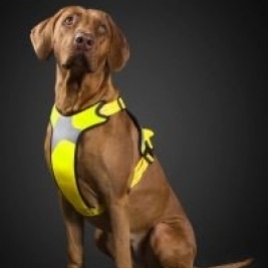 The adjustable collar and chest strap ensure a comfortable fit whilst the high quality 3M reflectors and bright high visibility dyes maximise visibility in the dark. The back includes a handle for better control of the dog in difficult places. Fully adjustable and highly durable. The Hurtta Dazzle Collar combines style with safety and comfort. Featuring high quality 3M reflectors which are highly visible in the dark and low light conditions, Hurtta Dazzle Collars include a soft Neoprene padding, offering the ultimate in comfort. The collar is easy to adjust for a comfortable and safe fit and the ring attachment secures the lead without fear of it coming unfastened. The Hurtta Hiker Belt is perfect for hands free dog walking, jogging or running its also ideal for people who have difficulty holding a standard leash. The belt is one size with adjustable waist and leg straps for a secure fit. Its modern, functional design features lightweight breathable materials (only 320g), a zipped pocket for a mobile phone, treats and also a pull through aperture for waste bags. It also has a elasticated detachable pocket for a drinking bottle. The belt has a quick release clip so the leash can be let free in an emergency. Complete with 3M reflective strips. Suitable for use with all Hurtta leashes.